When he loses a highly publicized virtual boxing match to ex-champ Rocky Balboa (Sylvester Stallone), reigning heavyweight titleholder Mason Dixon (Antonio Tarver) retaliates by challenging the Italian Stallion to a nationally televised, 10-round exhibition bout. To the surprise of his son (Milo Ventimiglia) and friends, Rocky agrees to come out of retirement and face an opponent who's faster, stronger and thirty years his junior. With the odds stacked firmly against him, Rocky takes on Dixon in what will become the greatest fight in boxing history, a hard-hitting, action-packed battle of the ages! $17.003 million on -unknown- screens. When Sylvester Stallone announced plans to make a sixth Rocky movie, it sounded like a bad joke. We’d gone 16 years since the last installment in the series, and no one clamored for a new chapter. Indeed, over the 14 years between the original flick and 1990’s Rocky V, the movies suffered from less and less respect. Rocky V was actually a little better than its last couple of predecessors, but it didn’t end things on a memorable, satisfying note. Because of this, Stallone’s decision to resurrect his signature role 16 years after the “final chapter” smacked of desperation. Stallone’s career has essentially been stuck in neutral since the early Nineties, so a new Rocky movie felt like a sad choice. I guess no one should count out the Italian Stallion. Against all odds, the underdog story produced a nice little success. 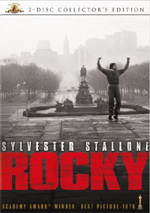 2006’s Rocky Balboa received pretty positive reviews and found a decent audience. No, its $70 million gross won’t make any heads spin, but given the immense opposition toward it raised by many moviegoers, the fact it made more than 27 cents should be seen as remarkable. A few years after the death of his beloved wife Adrian, former boxing champ Rocky Balboa (Stallone) lives a pretty lonely existence. Mired in the past, he spends most of his time with brother-in-law Paulie (Burt Young) or at the restaurant he and Adrian started together. Now involved in the business world, his son Robert Jr. (Milo Ventimiglia) seems vaguely embarrassed by his old man, and they have a less close relationship than Rocky would like. Some elements start to drag Rocky out of his nostalgic funk. When he visits the old neighborhood, he meets Marie (Geraldine Hughes), the girl he chastised in the first movie. Now in her early forties, divorced and with a kid named Steps (James Francis Kelly III), Rocky befriends her and spends time with her and Steps. He even gets her a job at the restaurant and shows some glimmers of life. However, Rocky still feels like he misses something, so he decides to start to box again. In the meantime, heavyweight champ Mason “The Line” Dixon (Antonio Tarver) lives under a shadow, as critics constantly harp on him that he’s never faced a quality opponent. Dixon’s frustration maximizes when he “loses” a computer simulation between himself and Rocky. This leads to an unusual opportunity. Dixon challenges Rocky to an exhibition bout. Despite the radical difference in age and many warnings not to do it, Rocky agrees. The movie follows his path to the ring and the event itself. On the surface, Balboa shouldn’t work at all, partially due to the absurdity of its climatic conceit. A man pushing 60 who hasn’t fought in well over a decade tries to battle the heavyweight champ in his prime? All the heart in the world shouldn’t make a difference in that bout, as it should turn into a slaughter. Of course, I won’t discuss what happens, but it should come as no surprise that the expected bloodbath fails to materialize. The bigger shock comes from the way the movie makes the tale work despite its improbability. Much of the credit goes to the fact that like the original flick, Balboa isn’t about boxing. Pugilism acts as a means to an end to tell a character story. We remember the fighting in the movies and they produce excitement from those scenes, but they’re really about their participants’ lives. For the most part, parts two through five lost that thread, especially in Rocky III and Rocky IV. The first sequel essentially just remade the original, and while Rocky V attempted something of a return to the series’ character-based roots, it seemed half-hearted and unsatisfying. All of those missteps make Balboa more of a pleasant surprise. 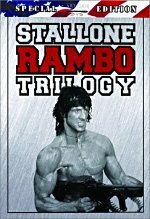 Its quality certainly inspires comparisons between Stallone and his character, as both fiction and reality show that talent remains. Maybe Stallone needed all of the failure of the last decade plus to put him in a place to make this sort of movie. Whatever the case, Balboa works as a character study. Again, parallels between the character and his creator become inevitable since we find both staring at the back end of existence and the question of what to do with that time, especially when your life’s work appears to be beyond you at that point. For Rocky, boxing seems to be out of the question due to age and decreased skills, while Stallone found himself closer to the borders of the movie business because of his lack of success over an extended period. The means may be different, but both Rocky and Stallone found themselves at crossroads in their lives, forced to figure out how to revitalize themselves. This factor makes Rocky’s journey in Balboa all the more involving. It would have been easy for Stallone to simply crank out another cartoony crowd-pleaser, and rock-‘em, sock-‘em slugfest that the suits could try to sell to the younger crowd. However, he resisted that side of things and went more for the AARP set. Balboa clearly is not a tale that will boast any resonance for folks in their teens or twenties. It looks through the prism of late middle age and throws no bones to younger crowds. And the movie prospers due to that decision. It would’ve been a terrible mistake to do something like drag out Mr. T for some goofy Clubber Lang action or to find another wacky villain. Unlike the last few entries in the series, Balboa features no bad guy. Dixon is the nominal antagonist, but he’s not an actual villain. Like Apollo Creed in the first movie, he bears no ill will toward Rocky; he’s just the opponent. That means the crowd will root against him, but he does nothing to earn our hatred, unlike Drago and the like. I applaud the decision to avoid a villain since it allows the movie to better concentrate on its themes. Balboa offers a surprisingly glum, dour view of existence. Its main characters tend to be lonely and without much direction in life, so this doesn’t stand as a happy-happy take on matters. Of course, that contributes to its power, as we see how people can lift themselves and reinvigorate their lives. For the first time in years, Stallone demonstrates actual acting chops in Balboa. As each sequel progressed, he made Rocky less and less like a human and more like a cartoon. The style in which he played the part changed; Rocky III made him an emotionless automaton, while Rocky V turned him into a goofy parody. The common factor came from the distance each had from the natural, endearing performance found in the first movie. In Balboa, Stallone manages to channel the elements he used in the original to once again form a Rocky we see as real and likable. Never did I imagine that Rocky Balboa would amount to anything more than an embarrassment. To my shock, the movie creates a memorable emotional journey that gives the lead character a fitting finale. It redeems the series and almost allows us to forgive all the terrible sequels. Rocky Balboa appears in an aspect ratio of approximately 1.85:1 on this Blu-ray Disc. The movie featured a consistently good transfer. Sharpness usually appeared strong. A smidgen of softness interfered with a few wider shots, but those distractions remained minor. The majority of the flick offered good clarity and delineation. No jagged edges or shimmering appeared, and edge enhancement also seemed to be absent. The movie featured stylistic grain but lacked other print issues. Until the climactic scenes in Vegas, the palette remained chilly. The movie displayed a definite bluish tint and usually stayed within that realm, though the shots at Adrian’s Restaurant tended to be warmer and more inviting. The tone became livelier in Vegas, as one might expect from that setting. Across the board, the colors were good within these parameters. Blacks appeared deep and dense, while shadows looked smooth and clean. Overall, the visuals seemed satisfying. Though it didn’t dazzle, the Uncompressed PCM 5.1 soundtrack of Rocky Balboa packed a nice punch. Audio quality was very good. The movie suffered from some poor looping at times, but the speech always sounded crisp and concise, with no edginess or other problems. Music became a strength, as the score and songs were lively and vivid. Effects also appeared distinctive and dynamic. The entire track boasted tight, rich bass response. Given its status as a character piece, the movie didn’t feature tons of room for a dazzling soundfield. The fight at the end became the most involving sequence, and the track brought out the bout with good delineation and spatial impact. Music always showed nice stereo imaging, and general atmosphere was very good. The sounds of Philly surrounded us well and created a nice feeling of place. This was a quality track. In terms of extras, we begin with an audio commentary from writer/director/actor Sylvester Stallone. He offers a running, screen-specific chat. 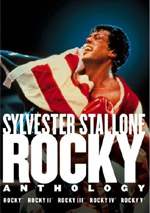 Stallone discusses story and themes, characters, cast and performances, locations and sets, cinematography, shooting the boxing scenes and other production topics. Stallone offers a decent, fairly introspective chat, but not one that often becomes especially captivating. The best parts come during the climactic fight, as he gets into those elements in an enthusiastic and informative way. The rest of the track provides reasonably solid notes, but it never quite turns into something truly substantial. Still, it’s a worthwhile listen. Seven Deleted Scenes and an Alternate Ending fill a total of 23 minutes, three seconds of footage. We find “Paulie Paints” (2:24), “Breakfast” (2:07), “Andy’s Bar (Original)” (4:11), “Paulie’s Girlfriend Moves His Things” (1:16), “Rocky & Steps” (3:44), “Paulie Breaks Down” (3:37), “Rocky Sparring” (2:05) and “Alternate Ending” (3:39). Most of these offer additional character bits. They accentuate Rocky’s loneliness, and we get to know a little more about Steps and Paulie, The “Bar” scene works less well than the one in the final film, since the latter seems more desolate and pathetic. They’re good scenes and could fit into the end product without trouble; I don’t think it needs them, but they’re worthwhile nonetheless. As for the “Alternate Ending”, I don’t want to say too much because it’d offer spoilers. I will say that it completely alters the tone of the conclusion and really ruins the story’s purpose. I’m glad Stallone didn’t use it. Boxing’s Bloopers goes for 90 seconds. Despite the title, this compilation doesn’t focus on the ring. It’s just the standard collection of goof-ups and giggles, though s a few come from the climactic battle. Nothing terribly interesting appears, but it’s short and painless. Next come three featurettes. Skill Vs. Will: The Making of Rocky Balboa lasts 17 minutes, 45 seconds as it combines movie clips, shots from the set, and interviews. We hear from Stallone, producers Kevin King, Charles Winkler, and David Winkler, co-producer Guy Reidel, production designer Franco-Giacomo Carbone, and actors Antonio Tarver, Burt Young, Milo Ventimiglia, and Geraldine Hughes. We learn of the decision to extend the franchise and bringing it to the screen, story issues and character notes, casting and performances, Stallone’s work as director, sets and shooting in Philadelphia. “Will” serves as a decent recap of the production. The footage from the set proves the most interesting, as we get a decent look at the shoot. Add to that a mix of moderately useful notes and this turns into a satisfactory program. For the 15-minute and 36-second Reality in the Ring: Filming Rocky’s Final Fight, we discover notes from Stallone, Reidel, Charles Winkler, Tarver, King, David Winkler, boxing technical advisor Rob Sale, director of photography Clark Mathis and producer Billy Chartoff. As implied by the title, “Reality” looks at all the elements that went into creating the climactic end sequence. We examine Stallone’s training, shooting in Vegas, and the other details of choreographing and filming the fight. It works well, especially when we see rehearsal footage of Stallone and Tarver. The show gets into the subject with good detail and entertains along the way. Finally, Virtual Champion: Creating the Computer Fight fills five minutes, seven seconds with notes from Stallone as we watch the work that went into the sequence. This leads us through a variety of computer techniques utilized in the fake fight. We also can watch the bout without the cuts away to TV spectators. It’s a good take on the topic and fun to see. The disc opens with some ads. We find promos for Casino Royale (2006), The Pursuit of Happyness, Talladega Nights, Stranger Than Fiction, and Gridiron Gang. No trailer for Balboa shows up here. Rocky Balboa shows that life remains in the old Stallion. Touching, heartfelt and ultimately inspiring, it acts as the best of the series since the first flick. The Blu-ray presents pretty positive picture, audio and extras. This is a nice release and a satisfying movie. Note that this particular Blu-ray appears on its own as well as part of “The Undisputed Collection”. That seven-disc set includes this flick and its five sequels as well as a “Bonus Disc”. 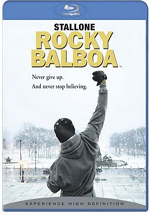 Rocky and Rocky Balboa can be purchased individually, but as of late 2009, the second through fifth movies only appear as part of “The Undisputed Collection”.